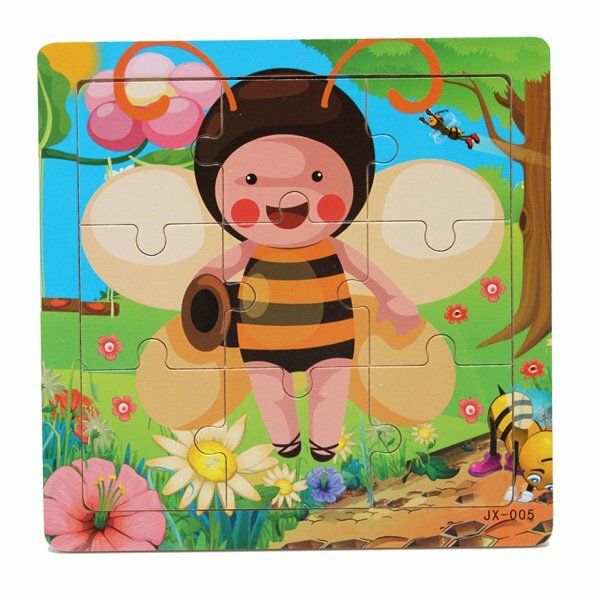 Baby Children Wooden Animals Puzzle Early Education Imposition ToyFeatures:1.The educational toys can exercise your baby's hands and brain coordination, treat things patience.2. Make learning fun - to help the baby familiar colors, 3.Flexibility can exercise your baby's little hands and brain.Description:Material: WoolPattern: Bee, Butterfly, Elephant, Lion, Giraffe, Monkey, Panda, TigerWeight: 50Size: 15 * 15 * 0.6CM,A small piece 4 * 4CM(1inch=2.54cm)Package include:1x JigsawNotice:1.Please allow 1-3mm error due to manual measurement. Please make sure you do not mind before you bid.2.Due to the light and screen difference, the item's color may be slightly different from the pictures.